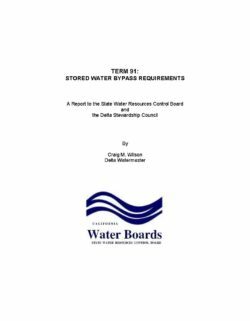 Pursuant to numerous Board decisions (D-1485, D-1641, Order 2001-05), the Projects are required to release stored water to meet water quality standards in the Delta (including flow and salinity standards) where natural flows are insufficient. The obligation was originally placed on the Projects as an interim measure pending future studies of how the obligation to meet water quality standards would be shared with other appropriators. In return for resolving Project protests on subsequent applications to appropriate water, Term 91 was developed and made a condition to permits issued after 1965. Term 91 prohibits diversions by these Permittees when natural and abandoned flows to the Delta are insufficient to meet the water quality standards and the Projects are supplementing such flows with previously stored water to meet the standards. The purpose of this report is to explore the enhanced use and more vigorous enforcement of diversion curtailments as a means to achieve flow standards. This subject matter is relevant to the Delta even through the Projects are under a present and legal obligation to meet existing flows standards.